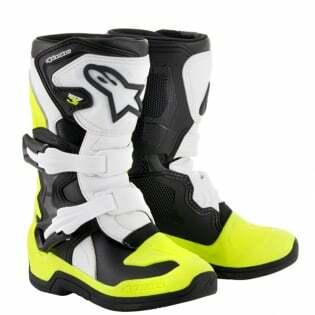 The latest Alpinestars Tech 3S Boots are technical, high-performance motocross boots for entry-level youth riders. With a brand new design for impressive performance, comfort and safety at an astonishing price. If your child just getting into motocross or off-roading, you don’t want to spend hundreds on your kid’s motocross boots that he or she will outgrow by the end of the season. 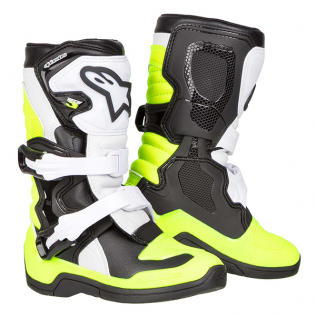 Check out the Alpinestars Tech 3s Boot that provides ample protection and amazing comfort without breaking the bank. 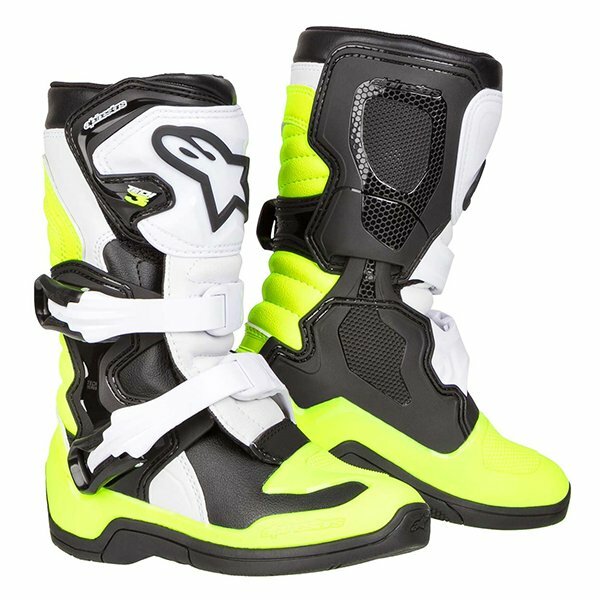 These motocross boots are specifically designed to accommodate an up and coming youth rider with smaller feet without sacrificing durability, protection or support. The design is inspired by the much more expensive Tech 10 model that features unparalleled support and security by having an injected high modulus that have a profile that provides exceedingly high levels of impact and abrasion resistant. It is important to get your new and upcoming motorcycle rider motocross boots and gear with abrasion resistance so he or she can ride all day long without his gear influencing his decisions. These boots allow your child to first wear the boot with the modified development and has he or she grows they are able to use the standard sized insole and ultimately increase the longevity of this product. Upper construction is made from innovative and list microfibre material that is flexible and abrasion resistant. Light microfibre on front and rear bellow gives more comfort on the flexible area. Extended PU Synthetic gaiter helps seal out excessiver water and dirt entry. Rear TPR gaiter patch applied on top of the TPU calf protector give protection and comfort on rear flex. Injected TPU shin plate connected with the TPU medial protector panel, Velcro upper closure plus TPR flap for broad ranging calf fit, adjustment and support. Bio-mechanical medial blade system allows a good front and rear flex giving support and protection to the ankle. The erganomic TPU triple buckle straps are wrapping harmoniously the front flex from the medial protector to the lateral side without compromising the flex. New closure system includes three polymer buckles with an innovative closure system. This closure includes a ratchet with memory and a quick release/locking system with self-aligning buckles for easy and precise closure. All buckles are replaceable. Innovative one-piece TPU injected dual compound foot shell, reinforced by a metal shank inside a co-injected to reinforcement. 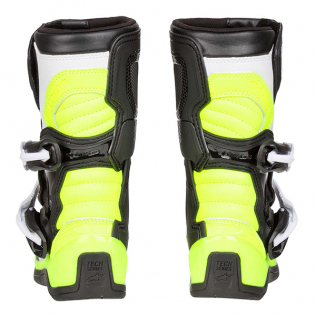 Soft foam surrounds the ankles and collar offer comfort and shock absorbing performance. Replaceable anatomical EVA footbed with textile lining on top. 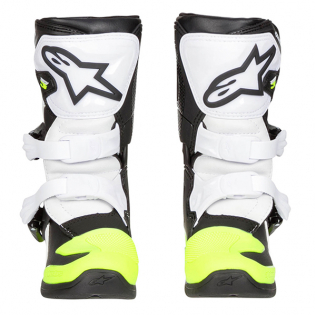 Specific Alpinestars all terrain design sole and high grip rubber compounds. The sole is replaceable. Tech 3s Youth boot is CE Certified to EN 13634:2010.